Background Studies of cardiac resynchronization therapy in addition to an implantable cardioverter defibrillator in patients with mild to moderate congestive heart failure had not been shown to reduce mortality until the recent RAFT trial (Resynchronization/Defibrillation for Ambulatory Heart Failure Trial). We performed a meta-analysis including the RAFT trial to determine the effect of cardiac resynchronization therapy with or without an implantable defibrillator on mortality. Methods We searched electronic databases and other sources for reports of randomized trials using a parallel or crossover design. We included studies involving patients with heart failure receiving optimal medical therapy that compared cardiac resynchronization therapy with optimal medical therapy alone, or cardiac resynchronization therapy plus an implantable defibrillator with a standard implantable defibrillator. The primary outcome was mortality. The optimum information size was considered to assess the minimum amount of information required in the literature to reach reliable conclusions about cardiac resynchronization therapy. Results Of 3071 reports identified, 12 studies (n = 7538) were included in our meta-analysis. Compared with optimal medical therapy alone, cardiac resynchronization therapy plus optimal medical therapy significantly reduced mortality (relative risk [RR] 0.73, 95% confidence interval [CI] 0.62–0.85). Compared with an implantable defibrillator alone, cardiac resynchronization therapy plus an implantable defibrillator significantly reduced mortality (RR 0.83, 95% CI 0.72–0.96). This last finding remained significant among patients with New York Heart Association (NYHA) class I or II disease (RR 0.80, 95% CI 0.67–0.96) but not among those with class III or IV disease (RR 0.84, 95% CI 0.69–1.07). Analysis of the optimum information size showed that the sequential monitoring boundary was crossed, which suggests no need for further clinical trials. Interpretation The cumulative evidence is now conclusive that the addition of cardiac resynchronization to optimal medical therapy or defibrillator therapy significantly reduces mortality among patients with heart failure. We performed a meta-analysis to further assess the effect on mortality of cardiac resynchronization therapy with and without an implantable defibrillator among patients with mildly symptomatic and advanced heart failure. We used the PICO (population, intervention, comparison and outcome) approach to develop the research question for our systematic review. The population of interest included patients with mildly symptomatic or advanced heart failure, with a QRS interval of more than 120 ms. The intervention of interest was cardiac resynchronization therapy with or without an implantable cardioverter defibrillator in patients receiving optimal medical therapy. Comparisons between the following interventions were made: cardiac resynchronization therapy versus optimal medical therapy alone; and cardiac resynchronization therapy with an implantable defibrillator versus a standard implantable defibrillator. Optimal medical therapy was defined as evidence-based use of angiotensin-converting-enzyme (ACE) inhibitors or angiotensin II receptor blockers, β-blockers, spironolactone (if indicated) and diuretics at a stable dose for at least one month. The primary outcome was all-cause mortality. Only studies that provided mortality data were included. We searched the MEDLINE (1980 to Dec. 31, 2010), EMBASE (1980 to Dec. 31, 2010) and Cochrane Library (1980 to Dec. 31, 2010) databases for literature on cardiac resynchronization therapy and implantable defibrillator in patients with heart failure. We also searched various sources of grey literature as well as the US Food and Drug Administration website. Bibliographies of relevant systematic reviews were manually searched. Details of our search strategies are available in Appendix 2 (www.cmaj.ca/cgi/content/full/cmaj.101685/DC1). Eligible studies were randomized controlled trials evaluating the effects of cardiac resynchronization therapy compared with control in adults with symptomatic heart failure or arrhythmia. Patients may also have been receiving medical therapy or have an implantable defibrillator. Two of us (R.P. and J.H.) independently screened each citation for inclusion. Two reviewers (G.W. and R.P.) 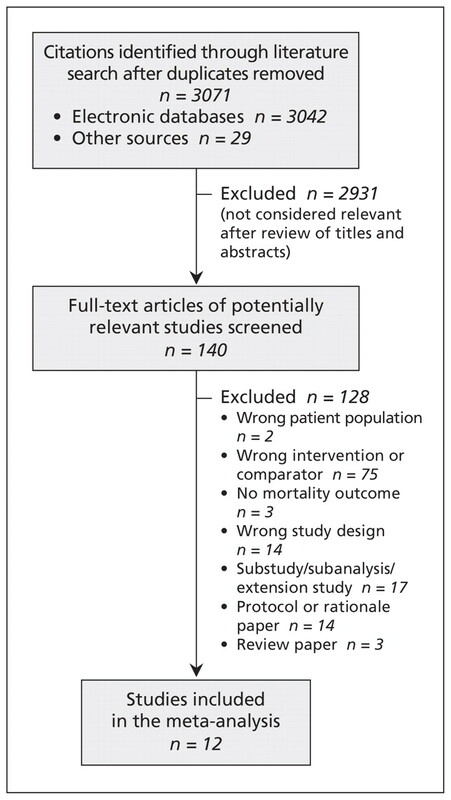 independently reviewed the full-text version of relevant articles and extracted the following data from the included studies: baseline characteristics of the study population, interventions and comparison groups, features of the study design, and the outcome of mortality. If necessary, discrepancies between the two reviewers were resolved by discussion involving a third independent reviewer (A.T.) to achieve consensus. The Cochrane Risk of Bias Tool was used to assess the risk of bias in the included studies.15 With respect to trials evaluating cardiac resynchronization therapy, random allocation of patients after implantation of the device, rather than before implantation, is an important source of bias, because these trials likely overestimate the potential benefits of the intervention. Flow diagram of selection of studies for the meta-analysis. The characteristics of the 12 trials are summarized in Table 1 (additional details about the studies are available in Appendix 4, at www.cmaj.ca/cgi/content/full/cmaj.101685/DC1). A total of 7538 patients were enrolled in these trials (4244 in the cardiac resynchronization therapy groups and 3294 in the control groups). Five trials compared cardiac resynchronization therapy plus optimal therapy (n = 1342) with optimal medical therapy alone (n = 1013).20,21,24,26,27 Seven trials compared cardiac resynchronization therapy and an implantable defibrillator (n = 2902) with an implantable defibrillator (n = 2281).14,19,22,23,25,28,29 The length of follow-up ranged from 3 to 40 months. Five studies had a follow-up of 12 months or less.19–23 Male patients accounted for 63% to 89% of the study populations. The mean age varied from 62 to 66 years. All of the 12 studies included patients with ischemic (38%–70% of patients) and non-ischemic cardiomyopathy. The mean left ventricular ejection fraction was consistent across the studies (21%–25%). The distribution by NYHA class was as follows: four studies enrolled only patients with NYHA class I or II heart failure; four other studies enrolled only patients with NYHA class III or IV disease; in the remaining four studies, 8%–80% of patients had NYHA class I or II disease (20%–92% had NYHA class III or IV disease). Although the minimum duration of QRS interval required for patient enrolment differed between the studies, the mean QRS interval was similar across the studies (153–176 ms). The risk of bias was often low except for implantation of the cardiac synchronization therapy device after randomization19–23,25,27,28 (Table 2). (For details see Appendix 5, at www.cmaj.ca/cgi/content/full/cmaj.101685/DC1). A summary of the overall effect of cardiac resynchronization therapy on mortality is provided in Figure 2. In general, a relative risk reduction of 22% in mortality was found when cardiac resynchronization therapy was added to treatment (relative risk [RR] 0.78, 95% confidence interval [CI] 0.70–0.87); there was no significant heterogeneity across the trials (I2 = 0). Results of random-effects meta-analysis of overall mortality among patients with heart failure given cardiac resynchronization therapy (CRT) in addition to optimal medical therapy (OMT) or implantable cardioverter defibrillator (ICD). Values less than 1.0 indicate a decreased risk of death with cardiac resynchronization therapy. Note CI = confidence interval, RR = relative risk. For complete study names, see Box 1. *All patients received optimal medical therapy. Five studies evaluated the effect on mortality of cardiac resynchronization therapy plus optimal medical therapy versus optimal medical therapy alone.20,21,24,26,27 All of these studies involved patients with NYHA class III or IV heart failure. 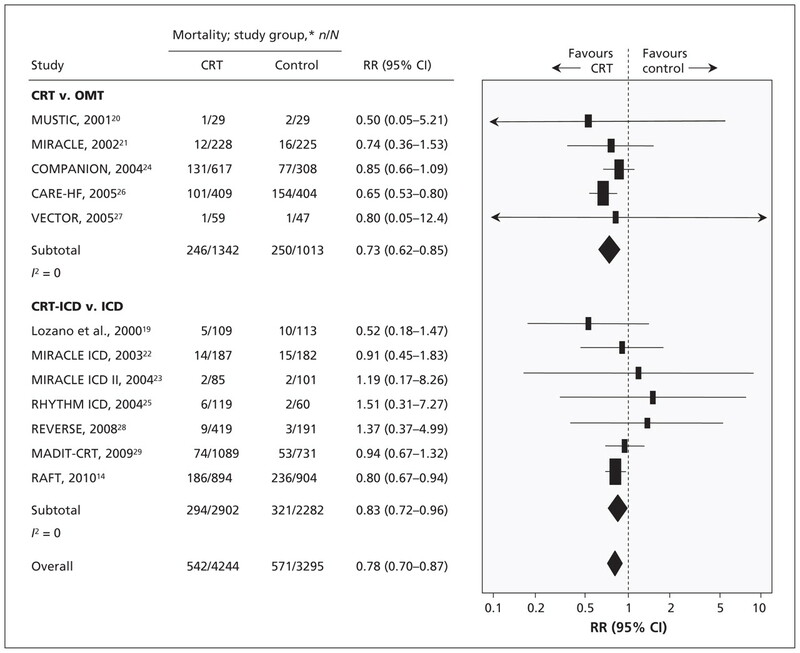 A significant relative risk reduction of 27% in mortality was found (RR 0.73, 95% CI 0.62–0.85) (Figure 2). There was no significant heterogeneity across the studies (I2 = 0); all studies indicated a relative risk reduction in mortality, but only the largest study (CARE-HF [Cardiac Resynchronization in Heart Failure]) reported a significant reduction (RR 0.65, 95% CI 0.53–0.80).26 Without the CARE-HF study, the reduction in mortality in the treatment group was not significant compared with optimal medical therapy alone. The CARE-HF study and the COMPANION (Comparison of Medical Therapy, Pacing, and Defibrillation in Heart Failure) study,24 were the principal studies that led to the change in guidelines recommending that cardiac resynchronization therapy be used in addition to optimal medical therapy in patients with NYHA class III heart failure and ambulatory patients with NYHA class IV disease. The intervention of cardiac resynchronization therapy and an implantable defibrillator, in addition to optimal medical therapy, was considered in seven studies that reported mortality.14,19,22,23,25,28,29 Patients with a spectrum of heart failure ranging from NYHA class I to IV were enrolled in these studies. A significant relative risk reduction of 17% was found (RR 0.83, 95% CI 0.72–0.96) (Figure 2). Although there was no significant heterogeneity across the studies (I2 = 0), before the RAFT study, three studies indicated a relative risk reduction in mortality and three studies indicated a relative risk increase; none of these relative risks was significant. RAFT was the largest study, with a significant relative risk reduction of 20% (RR 0.80, 95% CI 0.67–0.94).14 Without the RAFT study, the reduction in mortality with the intervention of cardiac resynchronization therapy and an implantable defibrillator was not significant (RR 0.93, 95% CI 0.70–1.23). Results of random-effects meta-analysis of overall mortality among patients with heart failure given cardiac resynchronization therapy plus an implantable cardioverter defibrillator (CRT-ICD) versus an implantable defibrillator (ICD), by New York Heart Association (NYHA) class. Values less than 1.0 indicate a decreased risk of death with cardiac resynchronization therapy. Note CI = confidence interval, RR = relative risk. For complete study names, see Box 1. *All patients received optimal medical therapy. Four studies considered the effect on mortality among patients with NYHA class III or IV heart failure when cardiac resynchronization therapy was combined with an implantable defibrillator.14,19,22,25 A nonsignificant relative risk reduction of 14% was found (RR 0.86, 95% CI 0.69–1.07) (Figure 3); there was no significant heterogeneity across the studies (I2 = 0). Without the inclusion of the RAFT study, the other three studies combined had a relative risk reduction of 17% (RR 0.83, 95% CI 0.48–1.43) with a wide confidence interval. With the recent addition of the RAFT study to the body of evidence on cardiac resynchronization therapy in patients with mildly symptomatic or advanced heart failure, the Lan–DeMets sequential monitoring boundary17 has now been crossed (Figure 4). 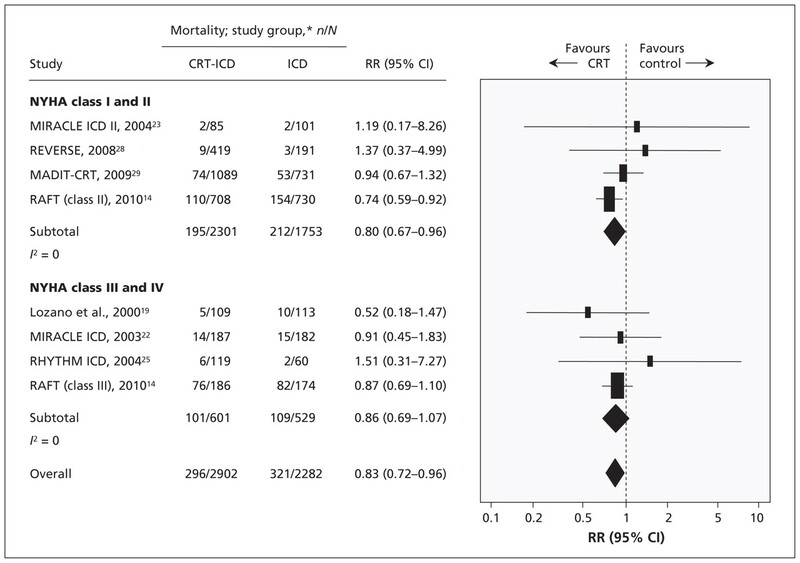 The cumulative evidence is now conclusive that the addition of cardiac resynchronization therapy to optimal medical therapy or to implantable defibrillator significantly reduces mortality (for details see Appendix 6, available at www.cmaj.ca/cgi/content/full/cmaj.101685/DC1). Cumulative meta-analysis of the effect on overall mortality of cardiac resynchronization therapy in addition to optimal medical therapy or implantable defibrillator therapy among patients with mildly symptomatic or advanced heart failure. 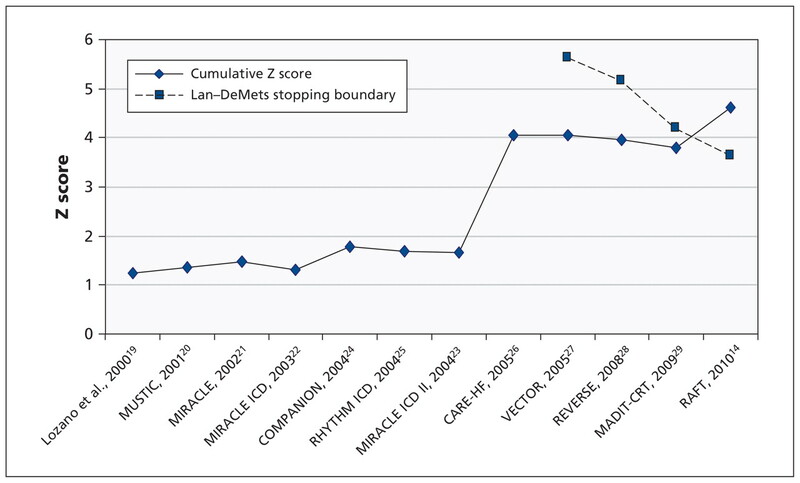 With the addition of the RAFT study, the cumulative Z score crosses the Lan–DeMets sequential monitoring boundary,17 which indicates that the cumulative evidence supporting cardiac resynchronization therapy in addition to optimal medical therapy or defibrillator therapy is now conclusive. For complete study names, see Box 1. Our findings indicate an unequivocal benefit of cardiac resynchronization therapy in addition to optimal medical therapy or an implantable cardioverter defibrillator in reducing all-cause mortality. This effect was particularly evident among patients with NYHA class II heart failure, a group in which a significant reduction in mortality had not been shown before the RAFT study, even in the presence of an implantable defibrillator. The overall beneficial incremental effect of cardiac resynchronization therapy is supported by findings from the analysis of optimal information size. With the recently reported RAFT study, the sequential monitoring boundary has now been crossed, which indicates that the cumulative evidence now conclusively shows that the addition of cardiac resynchronization therapy to optimal medical therapy or to implantable defibrillator significantly reduces mortality among patients with mildly symptomatic or advanced heart failure. This sequential monitoring boundary is designed to be restrictive so that, when crossed, there is clear evidence of benefit. The cumulative evidence available from the previous 11 studies was not sufficient for the boundary to be crossed. Our findings add to those of prior meta-analyses examining the effects of cardiac resynchronization therapy among patients with heart failure.13,30–32 Previous meta-analyses showed observations similar to ours when comparing cardiac resynchronization therapy with optimal medical therapy alone,13,32 but they did not show a mortality benefit when comparing cardiac resynchronization therapy plus an implantable defibrillator with an implantable defibrillator. The addition of the data from the RAFT study in our review substantially changed these findings, supporting cardiac resynchronization therapy over and above an implantable defibrillator in eligible patients with heart failure. The lack of a significant relative risk reduction in mortality among patients with NYHA class III heart failure may be explained by several factors. Many studies had short follow-up, with a range of 3–12 months.19–23 In addition, the number of patients with NYHA class III disease (n = 1330) was significantly smaller than the group with NYHA class II disease (n = 3947). This difference is predominantly due to the publication of the CARE-HF study, which showed a significant reduction in mortality with cardiac resynchronization therapy over optimal medical therapy alone. That study’s findings resulted in the American College of Cardiology/American Heart Association Task Force on Practice Guidelines to issue a class I recommendation in 2008 for cardiac resynchronization therapy in patients with NYHA class III heart failure, a left ventricular ejection fraction of less than 35% and a QRS interval of more than 130 ms.33 The RAFT study, which originally enrolled patients with either NYHA class II or III heart failure, changed its inclusion criteria in 2006 to include only those with NYHA class II disease, thereby limiting the number of patients with NYHA class III disease available for analysis. No further studies have been done involving patients with NYHA class III heart failure to examine the effect of cardiac resynchronization therapy over a standard implantable defibrillator. There are some limitations to our meta-analysis that are inherent to the studies we included. First, the timing of randomization to cardiac resynchronization therapy was not uniform across the studies. In many studies, randomization was done after a successful implantation, instead of at study entry. Deaths that may have occurred before or during implantation were not counted in these instances. Second, optimization of medical therapy was not accurately specified at baseline in the studies. This issue is of importance when examining the data by NYHA class. Third, many studies did not report outcomes by NYHA class; therefore, the data used in the NYHA II and III classification may not be completely accurate, because the raw data by NYHA class were not uniformly available. Fourth, follow-up varied greatly, with a large number of studies not reporting follow-up beyond 6 months. These limitations may significantly underestimate the true effect of cardiac resynchronization therapy among patients with heart failure, particularly when results of studies with prolonged follow-up are compared with those of shorter duration. Finally, the mechanism by which cardiac resynchronization therapy prevents mortality in this patient population remains to be elucidated. Our meta-analysis showed a significant reduction in mortality with cardiac resynchronization therapy in addition to either optimal medical therapy or an implantable cardioverter defibrillator. Although this benefit was evident across the spectrum of symptomatic heart failure, it was particularly evident among patients with mildly symptomatic heart failure (NYHA class II disease) who had a QRS interval of more than 120 ms, a finding not previously shown, even in the presence of an implantable defibrillator. The added risk of performing cardiac resynchronization in this patient population must be weighed against the benefit. Cardiac resynchronization therapy may now be extended to a much wider proportion of patients with heart failure, improving long-term outcomes in this growing population. Competing interests: George Wells, Jeffrey Healey, Mario Talajic, Malcolm Arnold and Anthony Tang were also authors of the RAFT study. Ratika Parkash has received a research grant from Medtronic Canada for research into outcomes with implantable defibrillators. George Wells has received speaker fees from Medtronic Canada. Jeffrey Healey has received research grants from St. Jude Medical and Boston Scientific for research into the role of defibrillation testing at the time of implantation and the significance of pacemaker-detected atrial tachyarrhythmias; he has received consulting fees from St. Jude Medical. Mario Talajic has served on an advisory board for Medtronic and has received speaker fees from Medtronic. Malcolm Arnold has served on ad hoc advisory boards for Medtronic and Biotronic and has received speaker fees from Medtronic for CME talks about device therapies. No competing interests declared by Shannon Sullivan, Joan Peterson, Elizabeth Yetisir, Patricia Theoret-Patrick or Marilynn Luce. Disclaimer: George Wells is a biostatistical consultant for CMAJ and was not involved in the editorial decision-making process for this article. Contributors: George Wells, Ratika Parkash, Jeffrey Healey, Mario Talajic, Malcolm Arnold and Anthony Tang participated in the development of the study concept. George Wells, Ratika Parkash, Jeffrey Healey, Shannon Sullivan, Joan Peterson, Elizabeth Yetisir and Anthony Tang contributed to the collection, analysis and interpretation of the data. Mario Talajic, Malcolm Arnold, Patricia Theoret-Patrick and Marilynn Luce participated in data collection and interpretation of the data. George Wells, Ratika Parkash, Jeffrey Healey, Shannon Sullivan, Joan Peterson, Elizabeth Yetisir and Anthony Tang participated in the drafting of the manuscript. All of the authors revised the manuscript for important intellectual content and approved the final version submitted for publication. Funding: This paper was supported by funding from the Canadian Institutes of Health Research as a University/Industry grant, with Medtronic Canada as the industrial partner.
. Treating the right patient at the right time: access to heart failure care. Can J Cardiol 2006; 22:749–54.
. On the rise: The current and projected future burden of congestive heart failure hospitalization in Canada. Can J Cardiol 2003;19:430–5.
. Effect of captopril on mortality and morbidity in patients with left ventricular dysfunction after myocardial infarction. Results of the survival and ventricular enlargement trial. The SAVE Investigators. N Engl J Med 1992;327:669–77. Effect of enalapril on mortality and the development of heart failure in asymptomatic patients with reduced left ventricular ejection fractions. The SOLVD Investigators. N Engl J Med 1992;327:685–91. (CIBIS-II). a randomised trial. Lancet 1999;353:9–13.
. Effects of controlled-release metoprolol on total mortality, hospitalizations, and well-being in patients with heart failure: the Metoprolol CR/XL Randomized Intervention Trial in congestive heart failure (MERIT-HF). MERIT-HF Study Group. JAMA 2000;283: 1295–302.
. The effect of spironolactone on morbidity and mortality in patients with severe heart failure. Randomized Aldactone Evaluation Study Investigators. N Engl J Med 1999;341:709–17.
. Amiodarone or an implantable cardioverter-defibrillator for congestive heart failure. N Engl J Med 2005;352:225–37.
. Ventricular reverse remodeling and 6-month outcomes in patients receiving cardiac resynchronization therapy: analysis of the MIRACLE study. J Interv Card Electrophysiol 2005;12:107–13.
. Cardiac resynchronization induces major structural and functional reverse remodeling in patients with New York Heart Association class I/II heart failure. Circulation 2009;120:1858–65.
. Effect of cardiac resynchronization therapy on left ventricular size and function in chronic heart failure. Circulation 2003;107:1985–90.
. Effect of cardiac resynchronization therapy on reverse remodeling and relation to outcome: Multicenter Automatic Defibrillator Implantation Trial: Cardiac Resynchronization Therapy. Circulation 2010; 122:985–92.
. Cardiac resynchronization therapy for patients with left ventricular systolic dysfunction: a systematic review. JAMA 2007;297:2502–14. Resynchronization-Defibrillation for Ambulatory Heart Failure Trial (RAFT) Investigators. Cardiac-resynchronization therapy for mild-to-moderate heart failure. N Engl J Med 2010;363:2385–95.
. Assessing risk of bias in inlcuded studies. In: Higgins JPT, Altman DG, editors. Cochrane handbook for systematic reviews of interventions. Version 5.0.0 (updated February 2008). London (UK): The Cochrane Collaboration; 2008. Available: www.cochrane-handbook.org (accessed 2011 Jan. 12).
. Cumulating evidence from randomized trials: utilizing sequential monitoring boundaries for cumulative meta-analysis. Control Clin Trials 1997;18:580–93.
. Discrete sequential boundaries for clinical trials. Biometrika 1983;70:659–63.
. Designs for group sequential tests. Control Clin Trials 1984;5:348–61.
. Impact of biventricular pacing on mortality in a randomized crossover study of patients with heart failure and ventricular arrhythmias. Pacing Clin Electrophysiol 2000;23:1711–2. Multisite Stimulation in Cardiomyopathies (MUSTIC) Study Investigators. Effects of multisite biventricular pacing in patients with heart failure and intra-ventricular conduction delay. N Engl J Med 2001;344:873–80. Multicenter Insync Randomized Clinical Evaluation (MIRACLE) Study Group. Cardiac resynchronization in chronic heart failure. N Engl J Med 2002;346:1845–53.
. Combined cardiac resynchronization and implantable cardioversion defibrillation in advanced chronic heart failure: the MIRACLE ICD Trial. JAMA 2003;289:2685–94.
. Effects of cardiac resynchronization on disease progression in patients with left ventricular systolic dysfunction, an indication for an implantable cardioverter-defibrillator, and mildly symptomatic chronic heart failure. Circulation 2004;110:2864–8.
. Cardiac-resynchronization therapy with or without an implantable defibrillator in advanced chronic heart failure. N Engl J Med 2004;350:2140–50. St. Jude Medical® EpicTM HF System including the EpicTM HF model V-338 cardiac resynchronization therapy defibrillator, the AesculaTM LV model 1055K lead, the QuickSiteTM LV model 1056K lead, and the model 3307, v4.5m programmer software: summary of safety and effectiveness. Silver Springs (MD): US Food and Drug Administration; 2004. Available: www.accessdata.fda.gov/scripts/cdrh/cfdocs/cfTopic/pma/pma.cfm?num=p030054 (accessed 2011 Jan. 12).
. The effect of cardiac resynchronization on morbidity and mortality in heart failure. N Engl J Med 2005;352:1539–49. St. Jude Medical FrontierTM model 5508L and FrontierTM II model 5586 cardiac resynchronization therapy pacemakers (CRT-P) supported on the model 3510 programmer platforms with the model 3307, v4.8m programmer software: summary of safety and effectiveness. Silver Spring (MD): US Food and Drug Administration; 2005. Available: www.accessdata.fda.gov/scripts/cdrh/cfdocs/cfTopic/pma/pma.cfm?num=p030035s003 (accessed 2011 Jan. 12).
. Randomized trial of cardiac resynchronization in mildly symptomatic heart failure patients and in asymptomatic patients with left ventricular dysfunction and previous heart failure symptoms. J Am Coll Cardiol 2008;52:1834–43.
. Cardiac-resynchronization therapy for the prevention of heart-failure events. N Engl J Med 2009;361:1329–38.
. Systematic review: cardiac resynchronization in patients with symptomatic heart failure. Ann Intern Med 2004;141:381–90.
. Effectiveness of cardiac resynchronization therapy in mild congestive heart failure: systematic review and meta-analysis of randomized trials. Eur J Heart Fail 2010;12:360–6.
. Cardiac resynchronization and death from progressive heart failure: a meta-analysis of randomized controlled trials. JAMA 2003;289:730–40.
. ACC/AHA/HRS 2008 guidelines for device-based therapy of cardiac rhythm abnormalities: executive summary. Heart Rhythm 2008;5:934–55. Predicting Benefit From CRT: When Is it Too Little, Too Late?